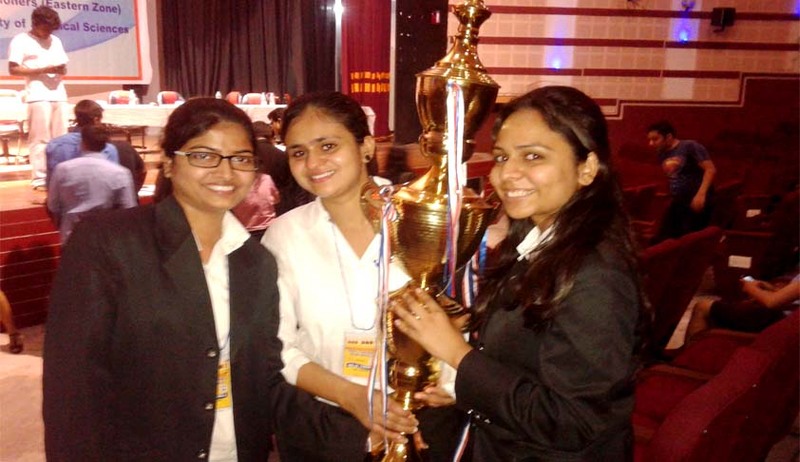 Anshu Bansal (5th Yr), Noopur Srivastava (5th Yr), Nidhi Jaiswal (5th Yr) of National Law University Odisha, Cuttack were the Winners at 1st Dr. B.P. Saraf National Tax Moot Court Competition, 2014′. The Moot was organised by AIFTP and hosted by NUJS, Kolkata. Live Law: How does it feel team? Team: When you hold the winning trophy in your hands, it feels great that your hard work has finally paid. Being a 5th years student, ending our law school on this note is indeed a moment worth remembering. Live Law: Participation in ‘Tax Moot Competition’ is not conventional; People prefer Constitutional Law, International Law or Intellectual Property Law. What was the motivation behind such choice? Team: The first thing about this moot that was really coveting was the subject itself i.e. Direct Taxation. Though none of us were much familiar with the cores of this area, yet the moot proposition of 28 pages impressed us a lot. Moreover, this moot being organized by AIFTP was an additional charm. Though Tax Law is a bit different from other subjects but once you get into it you will like it. Live Law: Tell us what it takes to be a great Team? Team: One of the most demanding factors which help the team throughout the preparation is team compatibility. We are glad that this was one of our strength. We managed to balance the situation by helping each other in all odds. We appreciate Researcher’s patience in the entire process. Apart from this, it is equally important for a team to go through a healthy discussion while preparing. Throughout the moot , we tried to understand each other’s strength and weaknesses and this helped us a lot to improve lacunas in our preparation. Live Law: How helpful do you think is mooting for a law student? Does it serve to build any practical skill? Live Law: How was this Competition? Who all were your Opponents? Team: Considering the fact that it was organized for the first time, the level of the competition was really tough with best of the teams participating. Also the subject matter which dealt with re-opening of assessments under the Income Tax Act was quite challenging. The total teams that appeared for the competition were 15 in number. It was a tough rush for our team to be held us against NLSIU, GLC, NUSRL and HNLU starting from prelims round up to finals. We believe that all the teams were very good but HNLU, Raipur was the toughest one in the final rounds against us. The presentation and research was remarkable. Even GLC, Mumbai was a tough deal. Team: We were pretty sure that our research and drafting in the memorials had a good chance of getting us best memorial but at the same time, we were a little conscious of the standards of teams that might confront us. Moreover, it was a core tax moot which demands presence of mind and good interpretative skills. Team: After semi-finals when the judges were really impressed with our arguments and research, we felt that we had a fair chance of performing better in our finals. The feedback given by judges also helped us to rectify some shortcomings in our research. Team: The overall experience was something which cannot be jotted down in words. The final round was judged by a 5-constitutional bench comprising of Honorable Former CJI Altamas Kabir, Justice A.K. Ganguly, Justice Sudip Ahluwalia, Justice Tapash Mukherjee and former Judge B.L Jain. It was for the first time we witnessed such reputed bench sitting to adjudge finals of a moot court competition. It was a like a Dream come true for each one of us. For the mooters, we would suggest that you need not know EVERYTHING in law but you must possess such persuasive skills and self-confidence as to articulate any and every argument in your favour (Even if it is not !!:D). And for the non-mooters, it is never too late to start mooting now because it can be an enriching experience for a life time. Team: We were intimated about this competition during the vacations and for the first 15 days each of us was busy interning. Moreover, further preparation was also not a cakewalk for us. During the entire period of our preparation (till memorial submission), all three of us were not together but still we are happy that we managed to do it properly. We believe that drafting a good memorial is basic foundation for any team to win any moot. Patience and confidence are the two important factor for a team to survive in a moot. As already stated above, the final round was judged by a 5-constitutional bench comprising of Honorable Former CJI Altamas Kabir, Justice A.K. Ganguly, Justice Sudip Ahluwalia, Justice Tapash Mukherjee and former Judge B.L Jain. This is something which is unprecedented. Live Law: Please leave a Message to the entire law fraternity and Mooters out there. Team: Inculcating a good mooting culture among the students is the first step to real life advocacy and each moot gives you an exposure to a particular subject which you will not get easily. When this work pays you with a win, you win a lifetime experience of sacrificing your friends for a preparation, patience in dealing your team mates professionally, handling your ego, taking huge workload, spending sleepless nights, developing core research skills, convincing a person with your speaking skills and above all grooming your personality to suit the rigours of this profession.